In 2019 the World Skills Competition will be held at Kazan, Russia. Considering the World Skills Competition, India Skills Competition, a pan India championship of skills, is held in every alternate year. And in 2018 India Skills Competition will be held to cream off candidates from different trades, who will be representing the country at the Olympics of Skills at 2019. 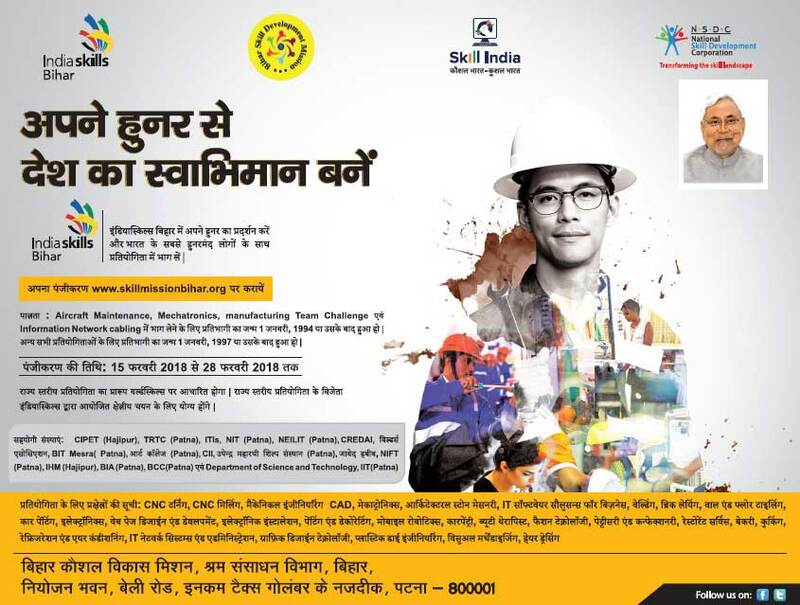 Keeping in mind the India Skills Competition 2018 and eventual participation of candidates from Bihar in World Skills Competitions 2019 at Kazan, the state level skills competition will be organized in the state on 20th and 21st April 2018 as mentioned in the timeline. The champions sprouting out of the State Skill Competition will harness their skills under the aegis of both state level experts and national level experts to participate in Regional Skills Competition then India Skills Competitions and eventually will represent the country at Kazan in 2019. The primary being Ensure participation of world class talent from Bihar in order to positively portray the skill ecosystem of Bihar at the Global Stage. The secondary is to create awareness amongst the youths of the state to take up skill development courses for an enhanced livelihood. Bearing in mind the training facility, geography and heritage of the state of Bihar, a total of 28 trades has been selected for the State Level Competition organized by the Bihar Skill development Mission. The courses have been selected after due discussions with the partnering organizations like CIPET - Hajipur, TRTC - Patna, NIFT - Patna, NEILIT - Patna, UMSAS, Art College, Patna, NIT – Patna, BIT – Mesra, Patna, IHM – Hajipur, Dept of Science & Technology. Considering the time constraints it has been decided that the state will organize only State level Skill Championship and there will not be District level skill competitions this time around. The candidates selected and mobilized from different partnering Institutions / Organizations will participate in the above State Level championship. In order to ensure widespread popularity and audience participation eventually resulting in an increased spectrum of participation in the coming years, the state skill competition across most of the trades will be held at central location in a single venue. The Premier Technical Institutions and Art Colleges partnering with state will be in charge for providing with the infrastructure for training purpose and also to offer experts to train the candidates in the trades chosen by the state. Once the state skill champions emerges out of the state level skills competitions, it will be the joint effort of state as well NSDC to groom and harness the skills of the participants to reach the next level. So that they come out with flying colours at the global arena. BSDM envisions that this initiative will create awareness amongst the youth of Bihar and embolden them to harness their skills either acquired through heritance or imbibed at different institutions and compete with the global competition.